One of my favorite genres and one that is the easiest for me to push aside is middle grade fiction. This year to make sure I get a little more children's and young adult fiction I thought I would designate the first Monday of every month Middle Grade Monday. While a lot of my picks this year are classics I am trying to branch out a little bit and read new or at least recent releases. Like this month's book! 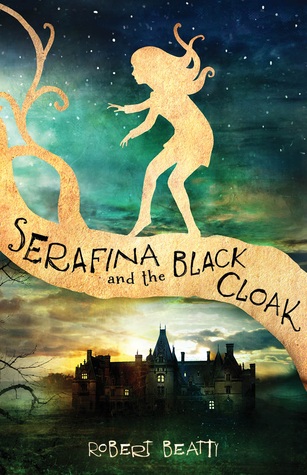 Description: Serafina has never had a reason to disobey her pa and venture beyond the grounds of the Biltmore estate. There’s plenty to explore in her grand home, although she must take care to never be seen. None of the rich folk upstairs know that Serafina exists; she and her pa, the estate’s maintenance man, have secretly lived in the basement for as long as Serafina can remember. My Thoughts: When I first saw the setting of this book I knew I'd be reading it. I LOVE the Biltmore. J and I actually went to Ashville on our honeymoon and one of my favorite days was exploring the Biltmore. There's nothing simple there. Every item is either created by a master or was owned by someone of monumental historical importance (like the Napoleon chess set which I remember seeing and was absolutely delighted when it was mentioned in the book). Just the idea of exploring it alone is enough to ignite anyone's imagination. I really liked that this book takes place towards the beginning of the Biltmore's life. We're seeing the mansion as it was lived in by the Vanderbilts and their guests - the balls, the parties and the time period where it was a home. However, I really felt the setting was underutilized. We see some of the Biltmore and then we're over in another super creepy setting in the woods. Both settings are strong and mysterious enough to merit their own book and having both in one book left me feeling like I was missing something and like I wanted more. It also seemed to take forever for the book to get started. It wasn't until about halfway through that it felt like things were starting to happen and I was engaged with the story. Previous to this it almost felt like a chore to listen too. I'm not sure if this was the fault of the audio edition or just the book itself. I did enjoy the last half and couldn't stop listening to the last couple of chapters. I don't want to give too much about the story itself but it felt like there was a lot of clutter. There's so much going on and it felt like most of it was crammed into the end. As a middle grade book I'm not exactly sure where this fits in. Darkness-wise I felt like it was comparable to the 3rd and later Harry Potter books but there was some imagery that was truly nightmarish that I think would have been difficult for my girls until they were more on the young adult side. They are a bit on the sensitive side so a child who is more drawn to scary books would possibly have no problem with it but this is a book I wouldn't recommend to children without that caveat. I'm torn about continuing with the series. I did enjoy the 2nd half - especially the last quarter but there was an awful lot that I was just okay with. If my library gets the 2nd book on audio and timing works out I might try it but at this point I don't see myself making an effort to get it. Rating: First half just okay, Second half good. Since it's the first in the series I'll average it out to good with hope the second will be better. There is some really good middle grade out there. I don't read enough of it. I recently read The Secret of Owen Jester and that's a good one as well. This one does sound like it has a creepy premise and I like creepy forests but in this case, yeah it sounds like the Biltmore itself could have been utilized more. I liked this book; it almost had a Neil Gaiman - The Graveyard Book - vibe. I liked Neil's more but I agree about it darkness being a bit scary for kids. Jellybean only read it during the day. She has the second book which I'll read one day. Hmm, I do like the sounds of the second half. As for age appropriate, I think it depends on the child. I read The Hobbit and such as a pre-teen and it could get dark. This is a book that I have had a bit of interest in but it sounds like it does have a few issues. It is good that you did enjoy the second half of the book. I've been wanting to read this one. I don't read a lot of middle grade fiction (yet--I expect that will change as my daughter gets older). I am glad you liked it overall, although it sounds like it could have been much better. Especially the first half of the book. I really want to get back into reading more middle grade. I used to read it a lot, but the last few years I just haven't. I'm sorry this wasn't a total hit for you. I also really love the Biltmore, although I haven't been there in years. Too bad it didn't fully utilize location. I live in NC and really want to get out there one day to explore in person. Glad things picked up the second half! Fingers crossed for book two! Good review, Katherine! I enjoyed the book but felt it was a bit uneven and the prose was sometimes clunky. I'd like to read the sequel, but haven't gotten around to it yet.